It's lectureship week, so we've got a houseful of family. 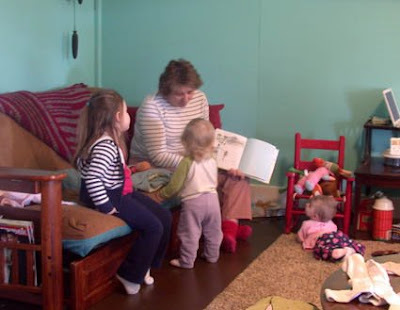 Here's mom reading to three attentive little girls. I'm a bit busy now, but mom's helping me with a little project that I'm hoping to turn into a little tutorial for this weekend. 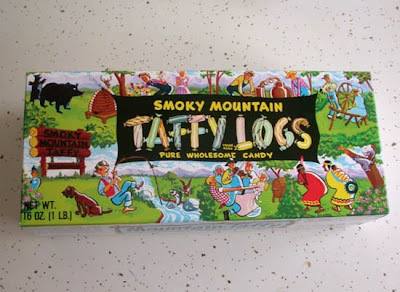 My sister got this taffy for my parents in Gatlinburg and I thought the box was really cool looking, not to mention the motto, "Pure Wholesome Candy." Isn't it all. Don't you also love it when hard candy says 100% fat free? Makes me laugh anyhow. I've enjoyed reading your postings since finding your blog.